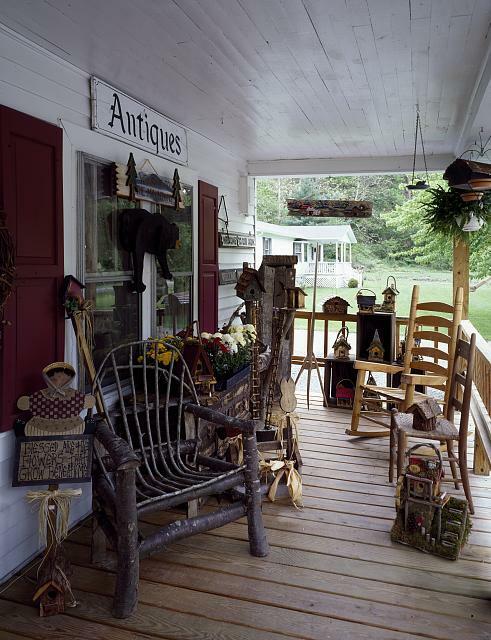 An antique shop available to AT hikers and tourists on vacation. 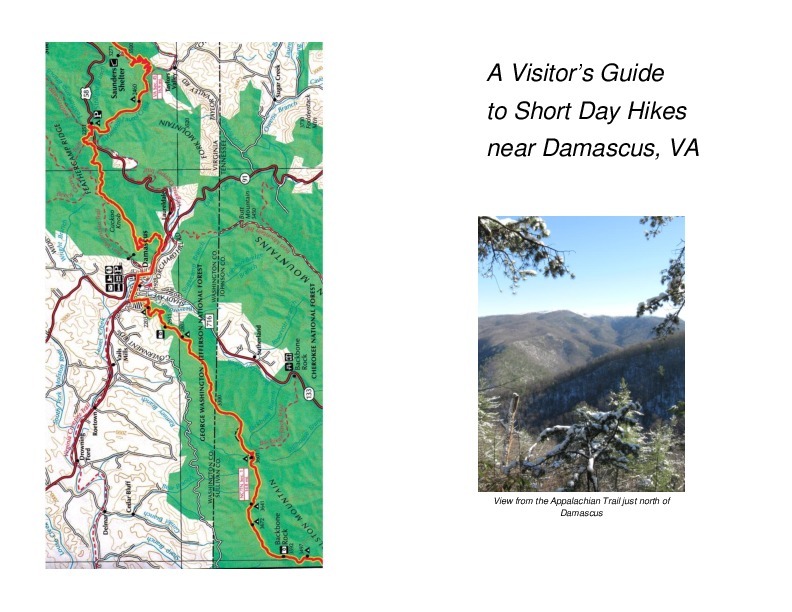 A guide available to visitors detailing short day hikes. Courtesy of the Appalachian Trail Conservancy & City of Damascus. Tourism plays a large role in Damascus historically, culturally and economically. Since the completion of the AT in 1937, trail communities served as outposts where outdoor recreationalists could restock on supplies or rest after a long day. Available within the small town are a number of stores and activities that AT enthusiasts or visitors may partake in. Local scenic trails intersect with Damascus besides the AT, offering a variety of hiking options to the townspeople and visitors. One such trail is the Virginia Creeper Trail. Originally a "rails-to-trails" system known only as "The Creeper" in 1984, the trail was officially decreed the Virginia Creeper Trail three years later. Reinforcing the town's nickname as "Trail Town, USA," Damascus is also home to the Daniel Boone, Iron Mountain, and Bicycle Trails among others. Besides local trails, there are several useful stores for individuals interested in hiking one of the local trails or the AT, one of which is the Mount Rogers Outfitters founded by local resident Dave Patrick. Hiking and history enthusiasts will be delighted to hear that a pair of Emma "Grandma" Gatewood's discarded sneakers can be found inside the MRO. For hikers and tourists who want to relax and socialize, the Damascus Methodist Church, also known as "the Place" and currently a hostel, is where visitors may stay the night for a fee. Such inns and outfitters are commodities for visitors and hikers alike, practically being responsible for culturally preserving and financially supporting the town. A sign depicting the AT in Damascus with tents and people in the background for Trail Days. In 1987, Damascus held its first ever Trail Days celebration. Held every year in May on the weekend after Mother's Day, Trail Days originally celebrated the 50th anniversary of the Appalachian Trail's completion and the hiker culture that was created as a result. Some believe Dan "Wingfoot" Bruce, a fellow AT hiker from Georgia, had created the festival while others point to local resident Charles Trivett as the festival's originator. Trivett himself was the man responsible for establishing the Damascus Methodist Church into the hostel it is today. Regardless of whoever created Trail Days, the spirit of the festival lived on through the townspeople and the hikers that celebrate it annually in the form of outdoor recreational and social activities, such as parades and concerts. With the help of former mayor Elizabeth McKee, Trail Days evolved from a self-contained local event to a sensational affair bringing revenue into the small town. 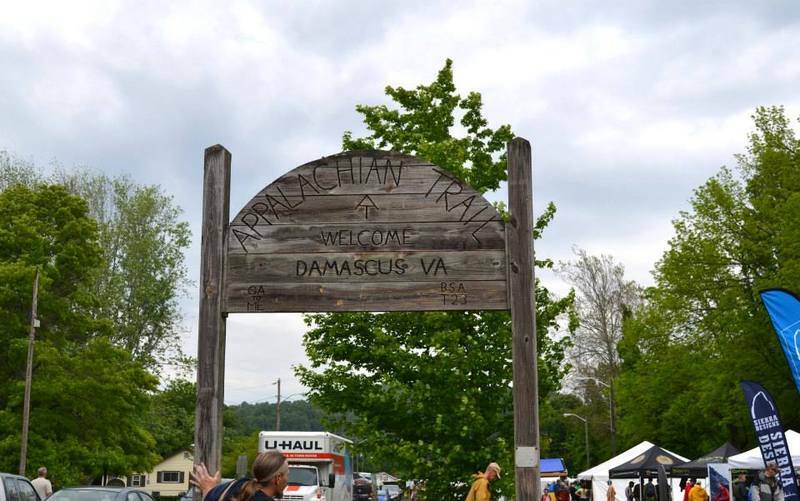 Trail Days effectively established Damascus as a community that celebrates the longevity of the AT and the culture created by the recreational and naturalists. In addition, with the increase in tourism seen in the 1990s, Damascus became a popular destination for hikers and vacationers alike, contributing to the community's survival in the process. In keeping with Benton MacKaye's original intention of trail towns, Damascus is an example of a cooperative community where individuals work together and appreciate nature, allowing for hikers and visitors to escape from the hassles of an urbanized society.